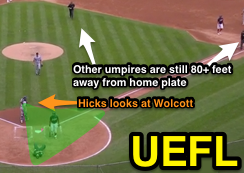 MLB Chief Baseball Officer Joe Torre concluded the Detroit Tigers did not intend to hit umpire Quinn Wolcott with a pitch on Wednesday two batters after Wolcott ejected Tigers catcher James McCann and Manager Brad Ausmus. Yet, that isn't the point. Joe Torre concluded "no wrongdoing" in Detroit. As we discussed Thursday, Buck Farmer's fastball that ended up striking Quinn Wolcott in the upper body after catcher John Hicks failed to catch it may not have met the intentional standard on all accounts, but the various reactions to the injurious event in the aftermath of Wolcott falling to the ground indicates a distinct lack of concern or compassion for the umpire's wellbeing from Detroit. In particular, catcher Hicks' comments on Thursday regarding his actions on Wednesday are unsubstantiated by video evidence and this incongruence of material truth from Hicks—and from his manager, Brad Ausmus—suggests, at best, simple antipathy and sin of omission; at medium, schadenfreude; or, at worst, an intent to allow the ball to hit the umpire. Regardless, AP's characterization that Torre found "no wrongdoing" adds yet another log to the burning pyre of interaction between the Commissioner's Office and World Umpires Association. The AP reported that Wolcott asked during the game, "they didn't do it on purpose, did they?" Bluntly, it is wrong for a catcher or an umpire to fail to demonstrate some degree of care for the other when an injury befalls one of the two. Hicks' conduct in walking toward his pitcher without breaking stride, purposefully, after the ball became dead and after he saw Wolcott lying on the ground is wrong; he did it, and thus, he did wrong. His attempt to justify it on Thursday was wrong. Failure to recognize the catcher's post-play actions is tantamount to condoning the action in a "what you permit, you promote" fashion. This likely will not bode well for mediating WUA's laundry list of grievances that has already resulted in one public protest against the Commissioner's Office.